Contrary to popular travel mythology, La Gomera isn’t a tourist free, natural paradise that is only populated by local farmers who communicate using a whistling language called silbo. 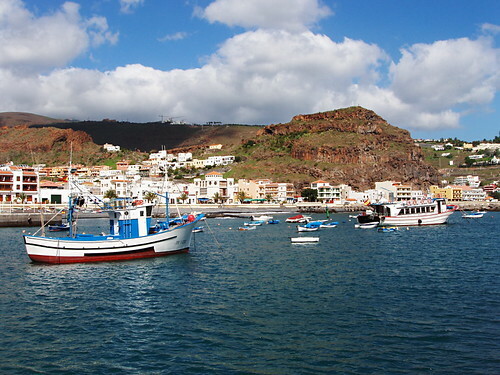 Whilst it does have these, it also has small tourist resorts and a sizeable ex-pat population – mainly Germans who long ago discovered the seductive beauty of one of the smallest of The Canary Islands. 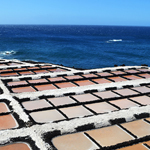 These facts mean it’s worth being aware of the character of the bigger towns on La Gomera in order to choose the most appropriate destination to suit your particular travel tastes. 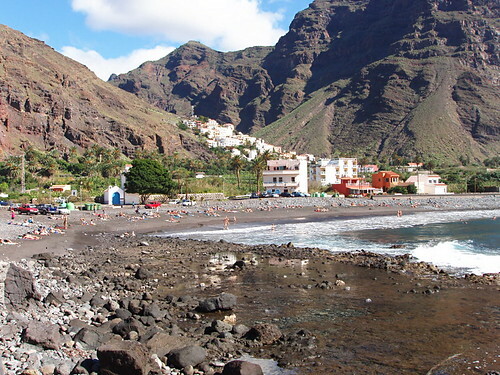 The capital of La Gomera is the size of a smallish town. 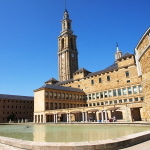 Its main claim to fame is that Christopher Columbus stopped off there (some say to have a final dalliance with the racy Beatrice de Bobadilla before sailing off the end of the world). 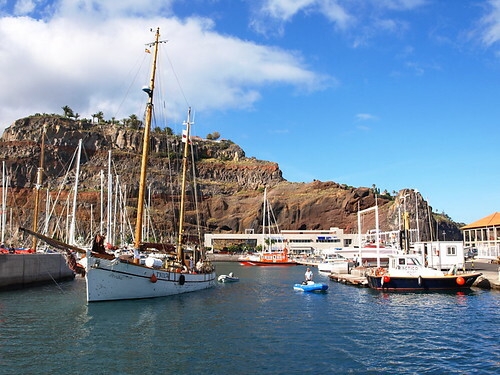 San Sebastián is also the main port on La Gomera and ferries sail from here to Tenerife, La Palma and El Hierro. Christopher Columbus apart, there’s not a great amount of history or interesting buildings to be found in San Sebastián but it’s got a likeable Canarian charm and is a good place for anyone wanting a decent sized authentic town on La Gomera with a choice of restaurants (mostly Canarian cuisine), shopping (people from across the island come to shop at the supermarkets here) and nightlife – La Gomeran style of course. Being on the south east coast it enjoys warm, sunny weather; it’s a good base to explore La Gomera as well as to do a bit of island hopping and it’s totally Canarian in character. The Valley of the King is the biggest tourist resort on La Gomera and is made up of a series of small neighbourhoods that link the port at Vueltas with the main centre at La Playa. Lying on the south coast Valle Gran Rey enjoys warm, sunny weather throughout the year and is a popular destination with German visitors. There are a number of beaches and attractive small coves between the town and the port, there’s also a nudist beach beach called Playa Inglés – an amusing name as ‘Inglés’ visitors are less likely to strip off here whereas there are plenty of German visitors who are less prudish. 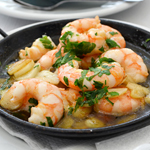 The biggest attraction in Valle Gran Rey is that it boasts some excellent restaurants. 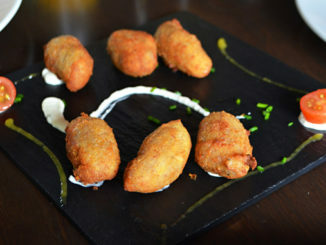 Unlike other towns on La Gomera where the choice is Canarian, Canarian or, at a push, Spanish cuisine, in Valle Gran Rey there’s North African, Asian, Chinese and Italian as well. There are a few decent bars in Valle Gran Rey. Some can get quite ‘lively’ late on and any night owl expecting a tranquil and chilled out bar scene may be in for a shock if they stray into certain establishments in the Vueltas area. Why choose Valle Gran Rey? 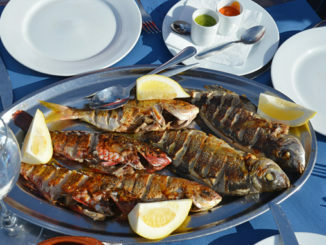 Good food , decent beaches, lots of sunshine and a good rousing bar scene. 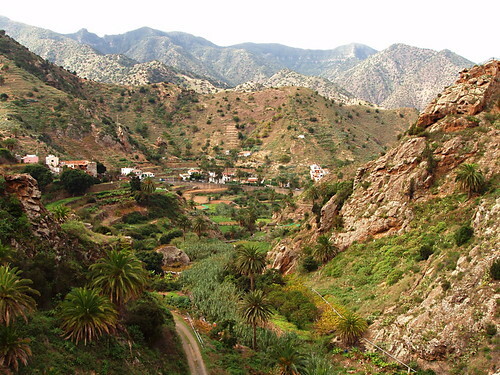 Head Inland and the landscape is quite precious, especially the views from the César Manrique Mirador at the head of the valley. Where Valle Gran Rey is favoured by German visitors, Playa Santiago is more the haunt of the British thanks to the Hotel Tecina on the cliffs at one end of the resort and El Balcón de Santa Ana on the cliffs at the other. The pebble beach has been made more user-friendly in the last few years and there are a few good restaurants in the town. Playa Santiago also enjoys year round warm and sunny weather and although still small, it has become more touristy over the last few years (relatively speaking off course). A bonus for anyone travelling from one of the other Canary Islands by air is that La Gomera’s airport lies just outside Playa Santiago. It’s warm all year; there are a few good restaurants, it’s a quiet and relaxing place to chill out and it’s got the Hotel Tecina -possibly its biggest draw. 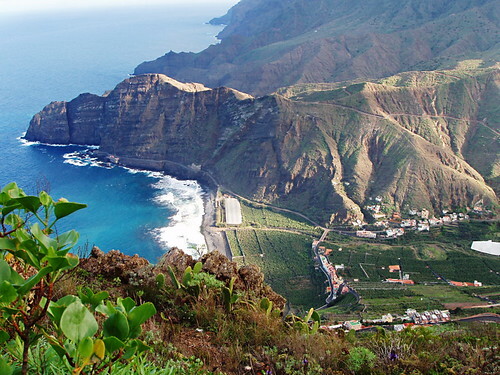 For me, towns like Vallehermoso and Hermigua are what visiting La Gomera is all about. They have more charm than the coastal resorts; the scenery around them is every bit as good as you’ve been led to expect, their character is distinctly Canarian, the accommodation is eclectically attractive and they are perfect bases for actually getting out and doing a bit of walking – which is La Gomera’s main attraction. It’s called the beautiful valley, what else do you need to know? Apart from being near magical scenic spots (tales of witchcraft are rife) including the enchanted lake and the Chorros de Epina, there’s the ancient Garajonay National Park to explore. Vallehermoso even has sea water pools next to the wonderful Castillo del Mar; a restored embarkation plant now occasionally used as a cultural centre. For many of the same reasons as choosing Vallehermoso; it’s a bona-fide La Gomeran town in a natural wonderland. There are some walking routes around Hermigua that can have you gasping for air with the impact of their beauty. You say some hiking routes at Hermigua will take your breath away. We are going there in next April. Can you tell me how to find this routes ? Most walking routes in La Gomera are pretty spectacular. We spent 7 days walking across the island updating routes for Inntravel and all the walks offered quite breathtaking hiking. We completed two wonderful walks in the Hermigua area – one from El Contadero to Hermigua (probably the more impressive of the two) and the other a circular route from Hermigua itself. Walking routes on La Gomera are reasonably well signposted but the Island’s Government is updating them and some signposts have been moved or are in the process of being put in place. As we were using Inntravel’s directions which were excellent (and now are even better as they’re bang up to date) I can’t really point you in the direction of alternative walking directions. On previous visits we have walked with locals. The La Gomera website does have suggested routes, but how reliable they are I couldn’t say. Whatever you use, I’m sure you won’t be disappointed with the scenery.